Chicken By-Product Meal, Ground Corn, Animal Fat (Source of Beef Flavour, Preserved with Mixed Tocopherols), Dried Meat By-Products, Brewers Rice, Wheat Flour, Natural Flavour, Grain Distillers Dried Yeast, Potassium Chloride, Choline Chloride, Salt, Taurine, dl-Methionine, Calcium Carbonate, Iron Oxide, Vitamins (Alpha Tocopherol Acetate [Source of Vitamin E], Vitamin A Acetate, Niacin Supplement, Vitamin B12 Supplement, Riboflavin Supplement, Thiamine Mononitrate, d-Calcium Pantothenate, Vitamin D3 Supplement, Biotin, Pyridoxine Hydrochloride [Vitamin B6], Folic Acid), Minerals (Zinc Sulfate, Copper Sulfate, Manganese Sulfate, Potassium Iodide), Mixed Tocopherols (Preservative), Turkey By-Product Meal, Dried Cheese. 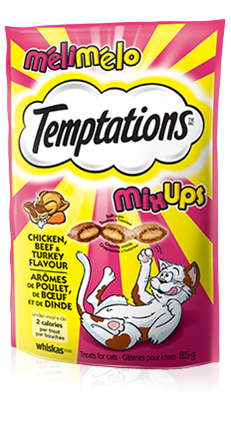 TEMPTATIONS® Mix-Ups Chicken, Beef, and Turkey Flavoured Treats for cats is formulated to meet the nutritional levels established by the AAFCO Cat food Nutrient Profiles for all life stages. AAFCO stands for the Association of American Feed Control Officials. AAFCO develops standards for dog and cat nutrient profiles which are used as model regulations in the United States. AAFCO feeding protocols are referenced the "Guide for the Labeling and Advertising of Pet Foods" endorsed by the Competition Bureau of Canada as well as in the Guidelines for the Canadian Pet Food Industry, developed and administered by the Pet Food Association of Canada. These documents were created to help pet food manufacturers ensure that the food that they manufacture, distribution and sale of animal feeds are safe and of high quality.